I wanted to start a topic covering the extensive use of the Palmaria in Libya. As a result of the Arab Spring, a certain famous Dictator became the target of an uprising which culminated in his untimely death, but not before spending months unleashing his military to try to maintain some kind of control. 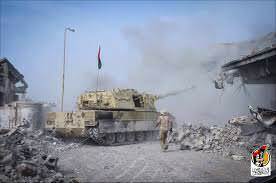 In those days it wasn't uncommon to see a Palmaria SPG getting blown apart by coalition airstrikes. At the time I believed most, if not all, were destroyed or at least damaged enough to be rendered useless. Sooooo it was a bit surprising to see this SPG once again fighting, town after town, against the Daesh (ISIS) explosion that racked N. Africa and the Middle East. Later on, when Warlords replaced ISIS in the eastern part of the country, the Palmaria appears once again to take part in the fighting, where it"s believed the last Palmaria has finally been destroyed. I created this thread as a gathering place for all the many pics, videos and information about the Palmaria including its connection the the SP-70 project from the 1960s & 70s. Various blogs and YouTube videos are floating around and it would be nice to have them all in one place. Here's some videos to start things off. Right outside the Ouagadougou center, leaning against the armour of its tank, we meet one of the heroes of this battle. The powerful engine of the tank rumbles as we speak. 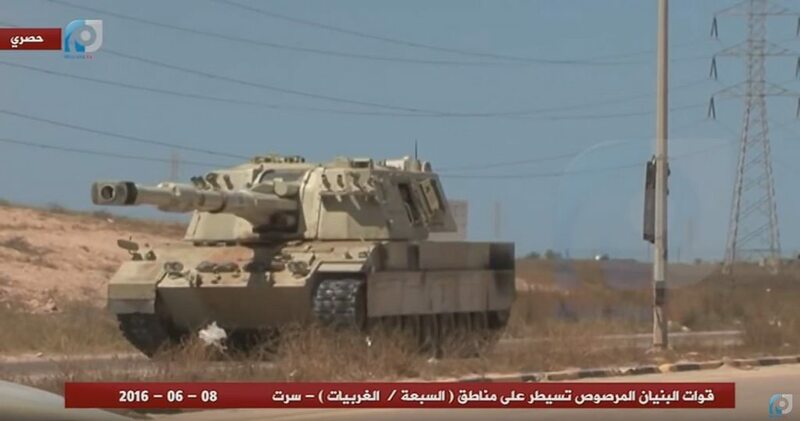 This is the ultimate weapon that Misurata has used to win the battle of Sirte; this is the "Cannon of Misurata" who defeated Daesh: the self-propelled howitzer "Palmaria", capable to fire 155mm shells up to 13 kilometers. 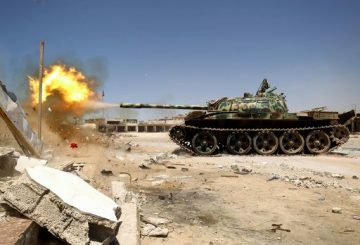 The lord and master of this weapon is the engineer Ahmed: "I live in Tripoli but I was born in Kikla", he says. He is the commander, and with him there is only the pilot. "Let me explain how we have used the cannon. When the British gave us the coordinates, we were able to shoot from 10 kilometers against the areas where there were men of Daesh. The terrorists were very dangerous with mortars: they had dozens of them, firing simultaneously to create an interdiction area with a radius of 500 meters; our infantry could not move, and in fact we have lost dozens of men to those mortars. First we started to fire from afar with the cannon; the more we approached, the more we lowered the cannon until we were shooting them in the face, in the buildings where they were hiding. This cannon has come all the way from Misurata, always fighting: we started from Abu Grain and then we arrived here in Sirte". 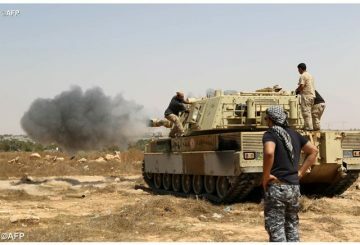 Interesting to see a self-propelled howitzer used as a tank. Yes, mostly direct fire. Although I do have a pic of two firing indirect over buildings. It has also been suggested the Palmarias enjoyed corporate sponsorship. That would certainly explain its continued maintenance and resupply. Corporate sponsorship, that is a new one for me. Interesting. I wonder f they will start painting company logos on the vehicles a la Formula 1 and NASCAR. Yeah, I would like to know more about the corporate sponsors. Something tells me OTO Melara was involved. 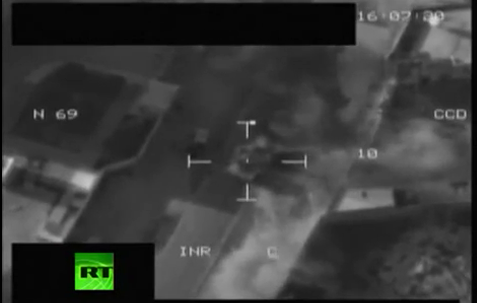 It looks like after the coalition airstrikes. That picture looks too clean, almost computer generated. I am a little suspicious. It's possible that it could be a snap shot from Armored Warfare. Though I don't recall the graphics being quite that good. Most likely, I think it's just a staged photograph. 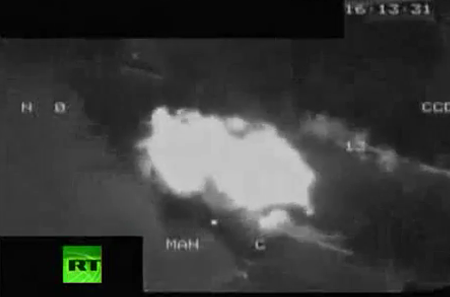 If you look at the last video from above you can clearly see the Libyans jumping in front of the camera to unleash their MGs and technical. It all looks rather staged. I come across some wild photography from that analisidefesa website, so I wouldn't rule out its authenticity based on clarity. The Article is dated April 4th 2019 and covers the latest fighting. "In the past there had been clashes between the LNA militia and others in defense of the capital and the proclamations of the general's spokesman, Ahmed Mismari, on an imminent takeover of the capital had proved to be inconsistent. 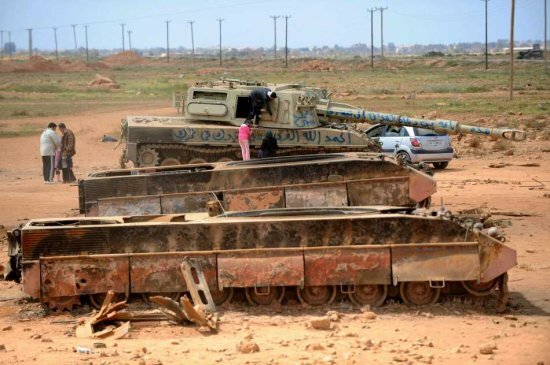 The fights, however, take place on the very day of orders given by Haftar to move in the west of Libya "different military units" to "flush out terrorist formations", a term used by the general for all militia of Islamist style." 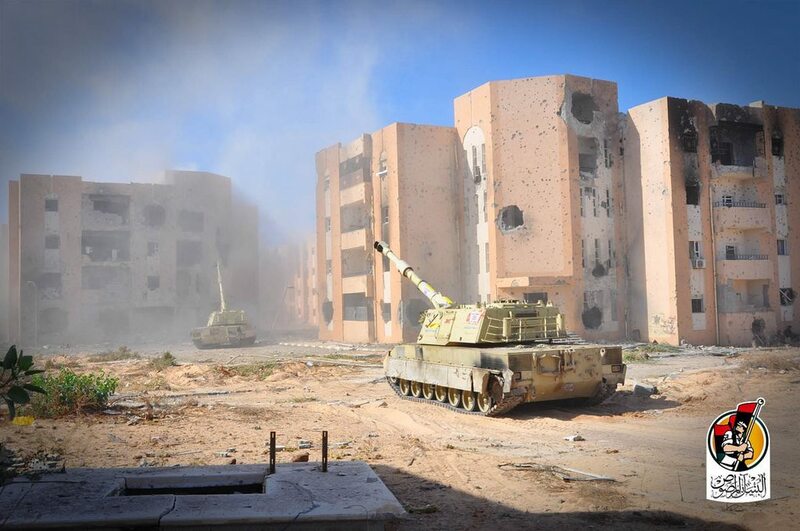 Operation Unified Protector - pro-Gadhafi tank (or Palmaria SPG) operating in Misrata, Libya is engaged.